Aval vadai or poha vadai recipe – when my family visited in February, amma brought me a huge sack of aval (poha or flattened rice). Well maybe not a huge sack but for someone who cooks for two, it definitely seemed that way. We didn’t have any when they were here so I was stuck with a whole lot of aval and a guy who doesn’t like aval nanachathu. So what’s a girl to do except resort to snack-making and deep frying? So here’s how you can make a quick aval vadai. Since there’s not much soaking and no grinding involved, this is a quick snack that will keep people guessing as to what went into their vadai. If you want more vadai or snacks recipes, check out this list of quick and easy evening snacks recipes. Soak it in about 1/2 cup water until soft – about 10 mins. Flatten into small discs that are not too thick. While shaping, if the mixture is too thick, dip fingers into a bowl of water and try to shape. 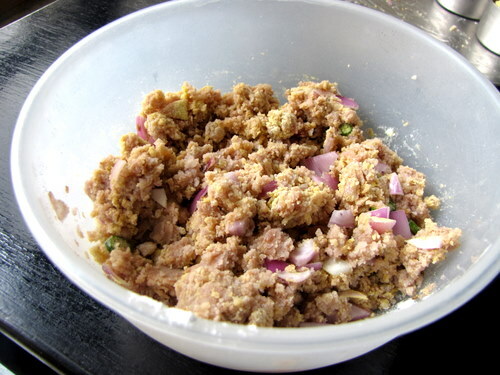 If the mixture is watery, add some besan or rice flour. Deep fry until golden brown. Serve hot with chutney. Or dunk them into some tomato rasam like we did! 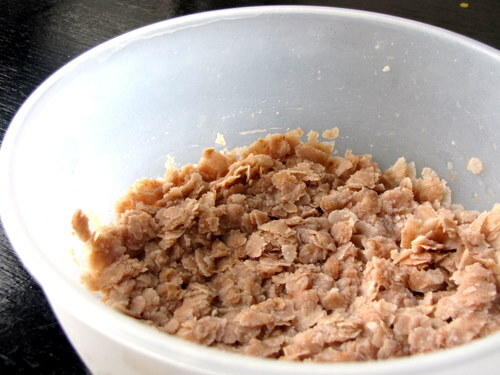 1.Soak aval in about 1/2 cup water for 10 mins, until soft. 2. Add the rest of the ingredients to this and mix well. 3. Shape into roughly 1/4″ thick discs. While shaping, if the mixture is too thick, dip fingers into a bowl of water and try to shape. If the mixture is watery, add some besan or rice flour. 4. Deep fry until golden brown and serve with chutney or dunk them into some tomato rasam. The texture is more smoother and spongier than lentil vadai. We loved it, especially as rasam vadai. The added bonus is, its so quick to make (although I didn’t tell TH that or else he would ask for this every weekend!). I never stock besan as I hardly use it. Can we use corn flour instead of Besan? Hi Nags, last saturday, when my mom came back from work, I surprised her with the hot and crispy vada. She went on guessing the Ingredient and she failed. Thanks for the easy do receipe! I made the vadas. They actually saved my day. It was one of those rare Sunday mornings that I had not had my breakfast planned in advance. I had checked your blog yesterday. Made the recipe. The discerning husband loved it. Have put it up on my blog already. Thanks! i love aval, cant wait to try this! Thank you for posting this – I love vada and I love south Indian food. I travelled round the southern states by train and had the most wonderful time. I shall follow your blog and I'm really looking forward to reading your posts! very interesting recipe with poha, hearing this for the first time. Looks good. 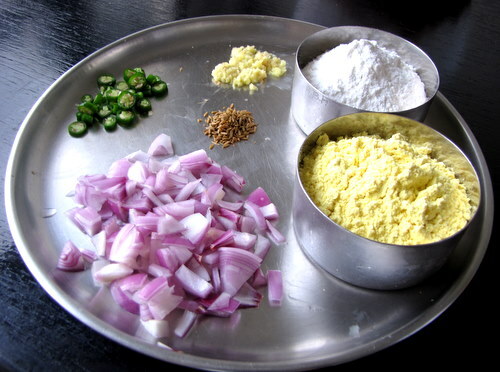 Sharmilee, baking aval vada sounds like a nice idea, try and do let me know! 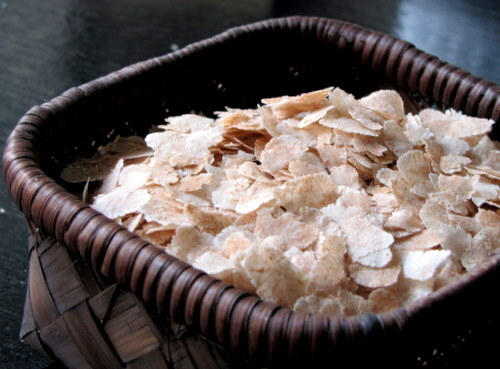 Srimathi – these are very crisp on the outside and chewy on the inside. So the outside texture will be smooth and crisp and the inside will be spongy and chewy. Fry one vada first and see how it comes out. You may need to adjust thickness of the shaped vada or adjust oil temperature if the inside is not getting cooked properly. This is a cool idea. I think its so easy to make it. Next time when we have to make vadai its going to be avil vadai. one ? I need to ask though, must we get a crunchy on the outside and soft on the inside. Can you please let me know what texture I have to look into? looks tempting with the rasam. great pictorial. Wonderful idea very innovative will surely give it a try. Hey.. I too make this recipe.. looks soooo perfect and tempting.. as usual lovely clicks.. thanks for sharing!! a quick snack..should try it sometime..
Oh – and I love the little brown aval basket! I'm sooooo making this soon – maybe this weekend for a special treat! 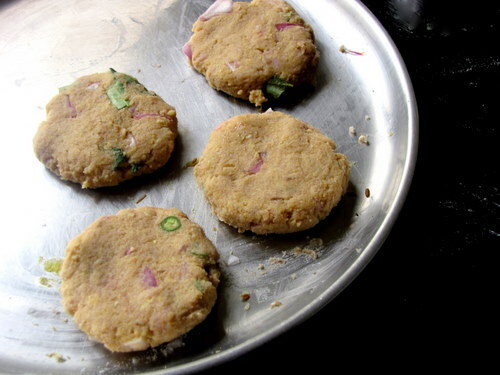 Love the quick vada idea! And the last rasam vadai option is just taking it to the next level! This is perfect. Never thought of it. Must try! 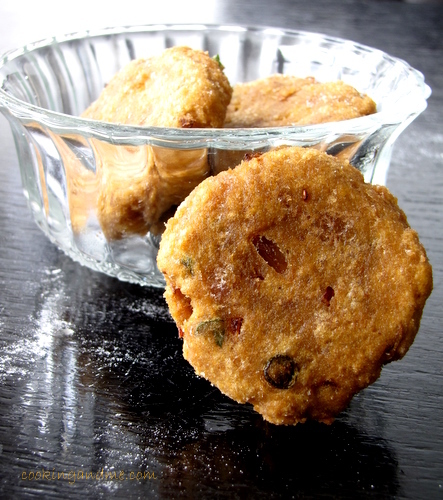 Great looking Vada for a snack, never thought of adding Aval to Vada, great idea, must try. interesting recipe! Never tasted these vadas before! Wow,I have never tried this so far,but sure sound simple enough to try this out! Not a fan of rasa vada but luv aval in any form so sure to try it sometime…Wat if we bake them…sure not crispier and tastier as the deep fried ones…wat say? When you say, it tastes good as Rasam Vadai, I want to give it a try. Very easy to make too. Thanks to your uncle for giving the idea. i too make this ,but i use mashed potatoes as biding agent. love the aval basket. Amazing!I appreciate the way u thought about vada when u saw the aval.